The Boy and I celebrated early while I was in Budapest with a meal at Onyx Restaurant, which earned its Michelin star in 2011. I have always wanted to go to a Michelin restaurant and thought that it would be more affordable in Budapest (compared to the ones in NYC or France for example). I’ve been to a couple fine dining restaurants, but this was my first Michelin star restaurant and I had no idea what to expect. Budapest is actually home to two Michelin start restaurants: Costes and Onyx. It was just my luck that Cortes was closed during my visit, so we went with Onyx. Onyx, located in the heart of Pest by Vörösmarty Square, opened in 2007 next to the famous Gerbeaud Cafe. The restaurant gets its name from the onyx stonework around the restaurant. The restaurant is under the direction of executive chef Szabina Szulló and sous-chef Tamás Széll. We were greeted at the door where our coats were taken. The inside of the restaurant was decorated impeccably. I was surprised at how small the restaurant was (only 55 seats). There were two rooms, but they were relatively small, giving it a cozy and intimate atmosphere. The restaurant was also quite busy the night we were there with almost every table in both rooms filled as the night went on. I’m kicking myself in hindsight for not using my proper camera. I had even brought it with me – it was in my purse – but I felt too self conscious pulling it out. So you all have to deal with under exposed, grainy and slightly out of focused images from me. The first order of business was getting our bread basket. They wheeled over a large selection of breads (see the 2nd photo in this post) that were baked in house and we had our pick. I love bread and pretty much wanted to try them all, but of course I wouldn’t be able to eat anything else. I ultimately decided on a slice of a chive and potato bread (so soft and delicious), a slice of squid ink bread and a couple of pogacas. 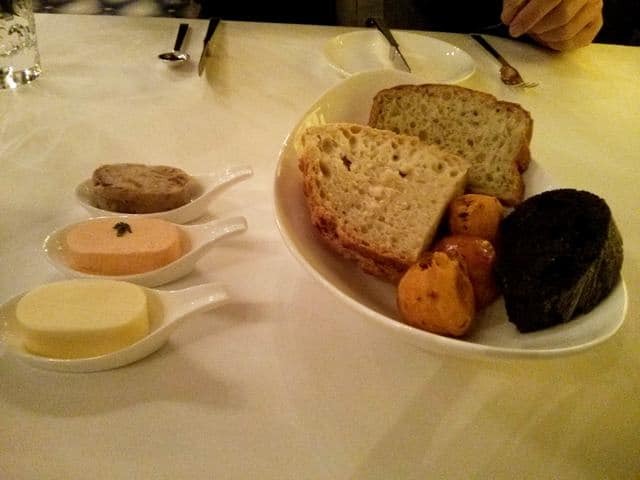 The bread was served with a side of three different spreads: a mangalica pork terrine, lard (?) with paprika, and some butter. 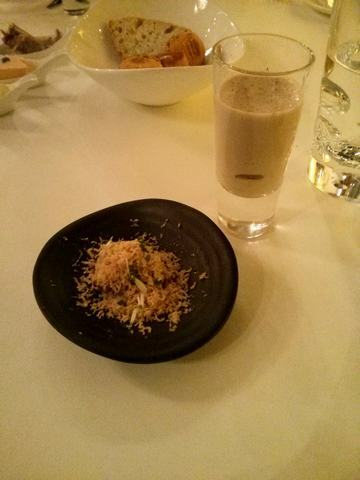 Shortly after, the chef sent out an amuse bouche. I don’t remember exactly what it was as our waiter spoke too quietly, and too quickly in English that I could barely understand him. From what I remember, it is a yam with chestnut shavings served with a ginger chestnut puree. 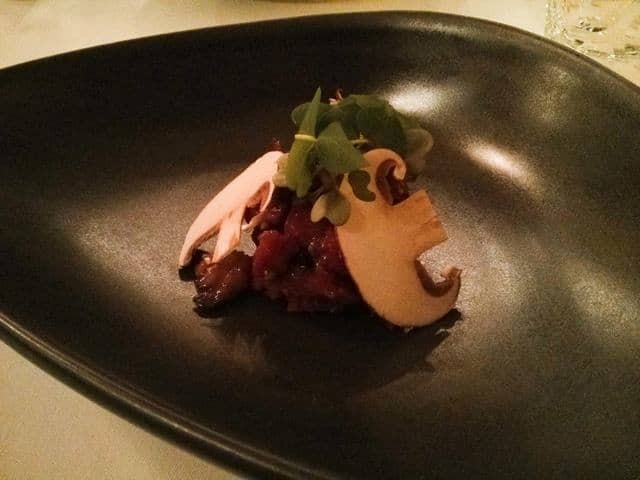 The first course in our tasting menu was a water buffalo steak tartar with oxtail, oysters and mushroom carpaccio (aka raw mushrooms). It was served with a crostini. I actually really quite liked this dish. I normally don’t enjoy the texture of raw meat, but this felt like it was cooked. It had a slight chew to it, not too tough, and paired well with the crostinis. 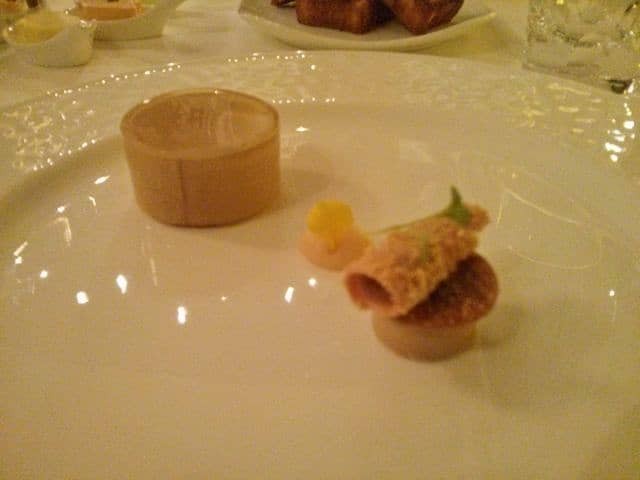 Next up was a trio of goose liver pate served with a sweet bread, similar to brioche. This was probably my least favorite of all the dishes. I’m not the biggest fan of liver and while I know goose liver is a specialty of Hungarian cuisine, I could only eat about half of it. The liver pate was incredibly rich. The Boy absolutely loved it though. The next course was probably my favorite of them all. Why? It was like breakfast and I LOVE breakfast. 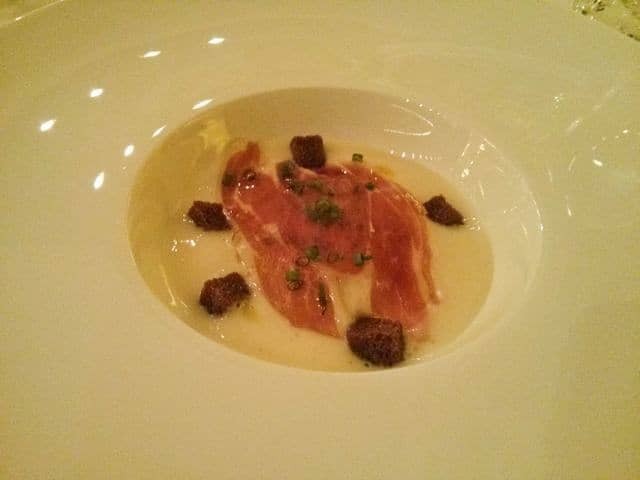 A free-range egg served with potato foam, mangalica pork and truffles. Essentially ham and eggs! The final starter was the famous Goulash soup which placed 10th at the Bocuse d’Or Lyon in 2013. This goulash soup was different from any other goulash soup I’ve had. 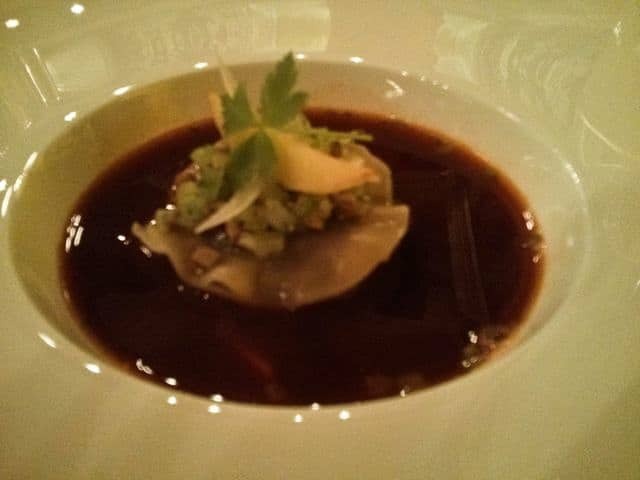 The meat and veggies were served inside of a dumpling. While it was presented very nicely, I found the whole dish to be overly salty and I couldn’t finish it. Disappointing. 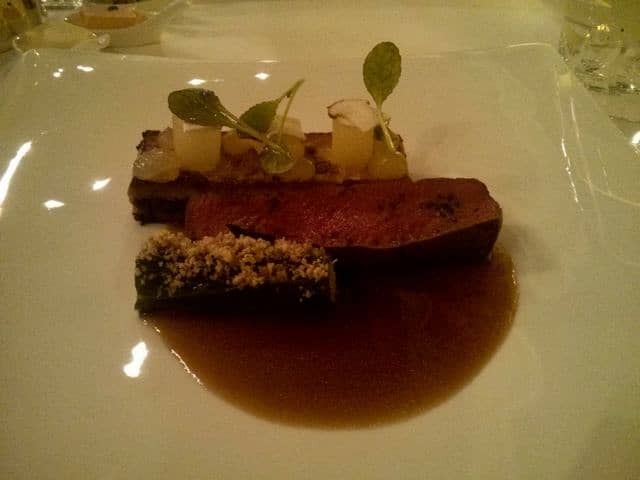 For our main course, we had venison served with a black pudding toast, and a cabbage roll of walnut and apple. I really enjoyed the venison and it was cooked really well. What was a bit strange was the cabbage rolled with walnut and apple. 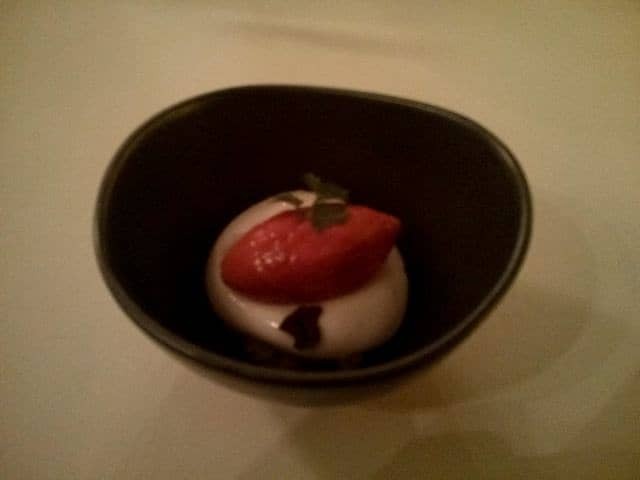 We were then given a palate cleanser of raspberry sorbet. Dessert was the famous Somlói cake which consisted of layers of sponge cake with pastry cream, raisins, walnuts, chocolate sauce, and whipped cream. I’ve had the traditional version before and didn’t enjoy it, but this modern take was delicious. I was so stuffed by now that I barely could eat half. After dessert, they wheeled a cart full of petite fours for us to select from. They all looked SO delicious and I wanted to eat them all, but I was completely stuffed. I did get a macaron though. I can never say no to a macaron. 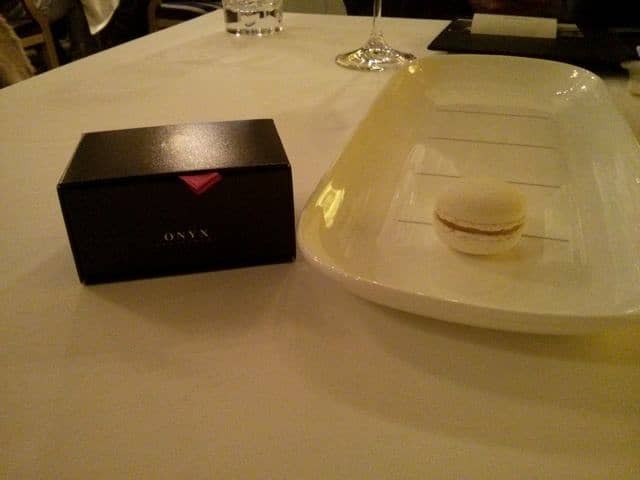 As a parting gift, I was given a small box and in it a macaron and a chocolate. I like that final touch – a sweet treat for the road home. If only I could have taken that petit four cart with me. And maybe the bread one too. The meal was a long one – our reservations were for 8:00pm and we ended up leaving at 11:30pm, just after the metro closed for the night. I felt a bit out of place the whole time I was there though. The food was okay. It was very rich and intense, but presented beautifully. Maybe I should have gone with their other tasting menu. Would I go again? Probably not. Perhaps I’ll try Costes next time. Our bill came to a total of 87 000 HUF or about $423 CAD. The tasting menu itself was 22 500 HUF ($110) and wine (for the Boy) was an additional 16 000 HUF ($77). There is also an automatic 15% gratuity that they add to the bill. They certainly give you a lot of food and the service was impeccable. They easily jumped from English to Hungarian depending on if they were addressing me or the Boy. Regardless, the meal was an interesting one. It was incredible indulgent and every once in awhile, it is nice to splurge and do something new. I’m glad I went and experienced it all. A life experience if anything else, and a great way to experience classy Hungarian cuisine beyond home-y meat and potatoes. Have you been to a fine dining restaurant? What was your experience like? Wow that looks and sounds brilliant!! I so miss fine dining since having kids! So true – its a good way of getting a feel of a new restaurant. It is always great to know that there are so cool restaurants in the capital of my country! I have never been to Onyx, but I have already read some nice critics about it! Thanks for sharing a piece of my country with your readers! There’s going to be a whole slew of posts coming up soon about Budapest! Stay tuned. Wow!! This restaurant looks and sounds amazing! Each dish looks delicious and I would love to sample all the desserts!! Yum!! Normally I’m not a dessert person, but oh my goodness did these look amazing. Happy Valentine’s Day guys! Looks like you had an amazing day! We spent our day in a little less spectacular fashion but equally as romantic in our eyes anyway. Certainly can see after all those courses that you would be pretty stuffed but each and every one looks really awesome. Those desserts look delectable for sure. It’s interesting reading about how different couples around the world celebrate their Valentine’s Day. This looks amazing. They let you choose your bread AND your dessert? I’m with you on the breakfast like dish, that one would have been my favorite too. But I’m so impressed they let you choose your own bread. Looks like you two had a great Vday! I’ve actualy never been fine dining… though I did once visit the ‘world’s cheapest Michelin star restaurant’ in Hong Kong, which we ate out of a carton in the street so not exactly fine dining, as such, but it was easily justifiable! It sounds great and with the service and unusual foods so well presented, ‘d totally love to try it out though. I’ve heard so much about this dim sum restaurant. All my coworkers have been talking my ear off about it since I told them about my visit to Onyx. Hopefully the next time I’m in Hong Kong I’ll get a chance to visit it. Haha that is true! When you earn in forints, you end up with a 6 figure salary! That was always my favorite joke. 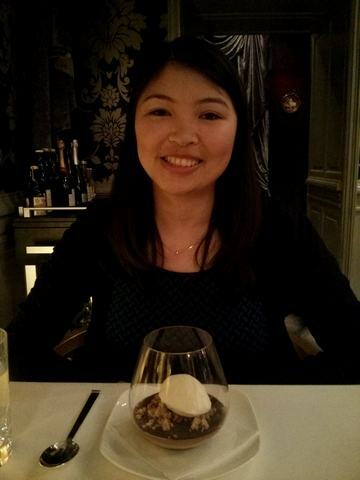 Visit to a Michelin star restaurant is high on my bucket list. The closest one to us is in Cormons, near Trieste. Bad for that goulash soup, because when we go to such a classy (and expensive!) restaurant we expect everything to be impeccable. I hope you get a chance to go one day! I know what you mean feeling kind of out of place in fine dining restaurants. My favorite part would have been picking the bread and the dessert. I like to choose my food, but with that being said I’d love to do something like this one day. You would have loved all the variety they had. I can’t even name them all and it all looked so good! Sounds good! I’ll distract them and you make a run for it 🙂 I thought long and hard about going beforehand. I tend to be frugal when it comes to travel, but I’ve always wanted to do it so I decided it was worth it. The food looks amazing, I won’t go into the technicals tho’ those petit fours look huuuuge! OMG! Everything looks delicious! Thats what I call a happy valentines day. Aw, I’m sorry to hear that. There are plenty of really great places to eat in Budapest, but it can be tricky to find them among all the restaurants. Onyx definitely was a memorable experience, even if it were a pricy one. Worth it in the end. Hey Adelina! Loved your views about Onyx! 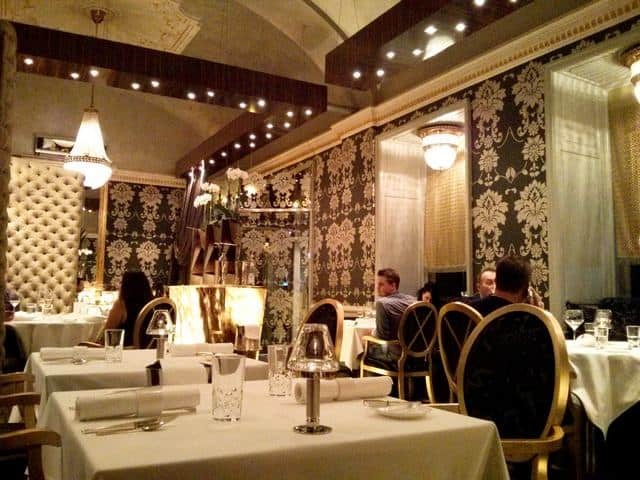 It does look really interesting..the type of food they serve, and how they plate….just wanted to ask though..did you get a chance to try Costes as well? Cause im in a bit of dilemma myself between the two…Cheers! Hi Trevor! Thanks for checking out my post. 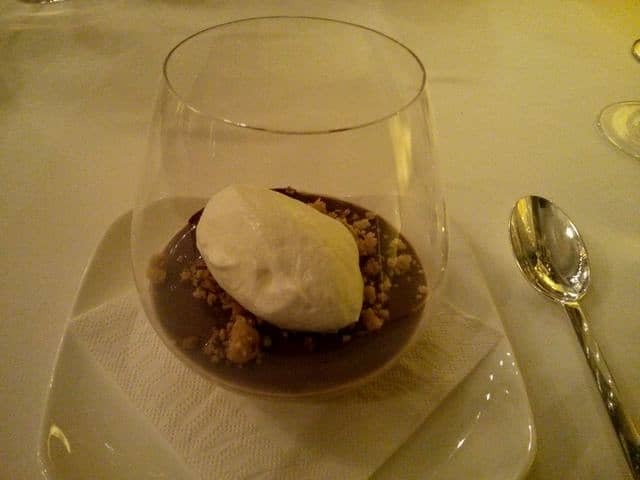 Unfortunately I didn’t get a chance to try Costes when I was in Budapest. They were closed during my most recent visit so that made my decision easier! 🙂 I hope you enjoy whichever one you decide to try!